Spinach is one of my favorite greens which one can find it on my table atleast once a week.I make palak paneer,alu palak,palak kofta curry occasionally just to avoid using paneer and alu at regular basis. One can use their imagination to create many healthier options using those lovely greens other than using them in regular dal's and stir fries as they are very versatile to mingle with any ingredient.I add sometimes soya chunks or fried tofu instead of paneer to make a healthier option.Adding Rajma/other beans to the gravy makes a complete protein packed food in one single dish.You can even substitute rajma with other beans like garbanzo beans,whole green moong and one can even add mashed paneer to make the gravy still tastier. This again goes to Divya's 'Show me your Curry' event. Soak Rajma in enough water overnight and change the water once. Add soaked rajma to it and add enough water and salt to it and pressure cook for 2 whistles and simmer for 10-12 mins until the rajma beans are soft and not mushy. In a pot bring water to a boil and add cleaned and chopped spinach,green chillies and sliced onions and cook for a couple of minutes.Remove it immediately from it and run the spinach mixture through tap water to retain the color of the spinach while cooking. Grind spinach,onions and green chillies to a fine paste. Heat oil in a kadai and crackle cumin seeds and add ginger garlic paste and fry for a minute. Add coriander and jeera powder's to it and fry well.Add spinach and onion puree and fry until the oil separates from the pan. Add cooked rajma(removing extra water) and add milk(or cream) and mix well.Check for the consistency and add enough water(use drained water from rajma) if required.Simmer it for 8-10mins. Add salt to taste(remember we added salt while cooking rajma),garam masala and amchur powder and mix well. Remove it from the stove and garnish with fresh cream and serve hot. Serve it hot with phulka/chapathy/Naan/Kulcha/pulao's. I always avoid mixing tomato and palak in the same dish,instead I add either lemon juice or amchur powder to give sourness to the dish.It is your personal choice to include what ever you want and adjust the sourness by adding more amchur powder or use lemon juice. In order to make the dish still richer and tastier add nicely mashed(1/2 cup paneer) to the gravy while rajma to the spinach mixture. For a Vegan version avoid cream and milk in the recipe. wow..what a beautiful presentation dear... curry looks awesome..
Rajma palak looks yummm..Onion flower is pretty to see too. That sounds one delicious combo... And yes, the variation from the usual panner and aloo is always interesting. Glad you tried and shared it here. Very healthy recipe indeed! Like the color, Pavithra. This is quite new to me,never heard before,look and sounds good prathiba! Looks so delicious and yummy with beautiful pictures prathy. Wow that a unique combo..yummy and very attractive..will surely give this a try. This looks super delicious! Bookmarked! chanced upon your blog while surfing the web.. loving your style of blogging n awesome recipe collection here.. i book marked some, have 2 go through some more..u have a great presentation style with stunning pics..
Rocking combo..never tried palak with rajam..sounds awesome, will give a try..thx for sharing. 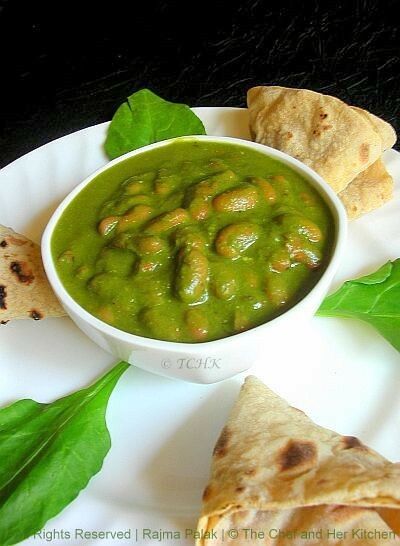 Rajma with palak sounds yummy n healthy. A rose with onion...cute! very creative and the snaps are perfect dear. I am a recent Palak convert! 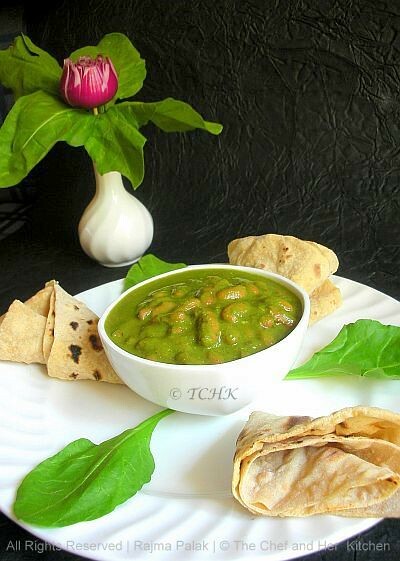 !made Palak Paneer recently,Palak Rajma is something new..bookmarked!! very new combination..looks healthy and delish! Soaked rajma right away. 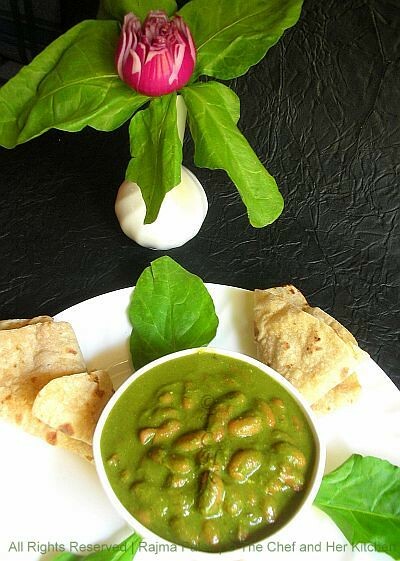 Tommorow's lunch bag palak rajma with chapathies.